Since the end of February 2018, we’ve seen a rise of DDoS Amplification attacks, with in some case more than 1Tbps of traffic generated. DDoS amplification attacks are very easy to launch and very difficult to protect against, putting almost any business at risk. In this article, we will explain the context, the functioning and some ways to mitigate this kind of threat. In the case of distributed denial-of-service attack (DDoS attack), the load of the attack is originating from many different sources, using generally a botnet and/or bad configured services (as we will see further). Unlike DoS, that type of attack makes difficult tracking the hacker and involves enormous bandwidth consumption of the victim. What’s more frightening is the ease of making a DDoS for cheap, even for someone with limited skills, because the artillery used is widely available for free or almost free. An amplification attack is a volumetric attack trying to exhaust the bandwidth of the victim through “reflection”, where an attacker will “ask” with a short message an information, in UDP, to a vulnerable service. The attacker will replace the source IP of the message with the IP of the victim, to convince the vulnerable service to “respond” directly to the victim. When the service responds with a message larger than the source message, it’s called amplification. The three-way handshake of TCP doesn’t allow that behaviour, as the source address cannot be spoofed - Wikipedia. 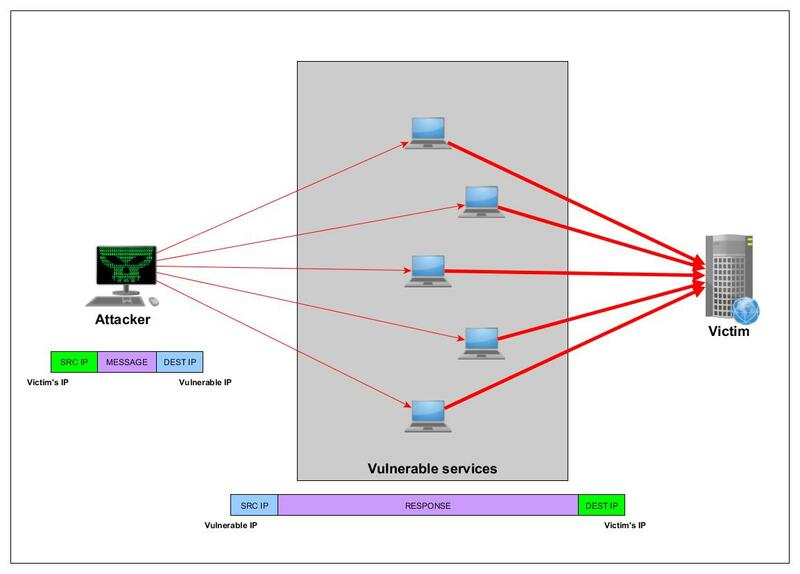 In this figure, we have described the specific case of a hacker sending directly a spoofed packet to several vulnerable services. In large scale attack, the hacker will use a botnet to send the initial packet from a big amount of sources, which will exponentially increase the effect of the attack. The potential effect of an amplification attack can be measured by the Bandwidth Amplification Factor (BAF), which can be calculated as the number of UDP payload bytes that an amplifier sends to answer a request, compared to the number of UDP payload bytes of the request (see below a list of known protocols and their associated BAFs. An up to date network/service diagram. A tested incident response plan with roles and contacts well defined (ideally also printed on paper, in case of unavailability of the whole network). A proper monitoring system that will alert you at the start of a DDoS. A firewall that block all traffic that is not explicitly permitted (incoming and outgoing). Use a properly configured load balancer and make sure it does not become a single point of failure. Assess regularly the security of your infrastructure and of your firewall rules. Ask your provider (ISP) for some temporary filtering (traffic scrubbing or traffic shaping). Take note of every action during an incident response (timestamp, actions, results, …). Escalate to a third party if no other solutions. And ... do not participate in a DDoS. Prevent open or misconfigured UDP services to avoid participating in a future DDoS. DDoS Amplification Attacks are not a matter of skills for a hacker, since there is a plethora of tools, more or less freely accessible. DDoS Amplification Attacks are difficult to mitigate since the IP of the hacker is hidden behind the reflection. Huge quantity of vulnerable services that can be used for the DDoS are available all around the world. At least beware to not participate yourself. You can the “Prevention and Response” section as inspiration for your own defence. Do not hesitate to contact us if you need help to improve your protection and incident response.